Sarah Lane in The Sleeping Beauty. Photo: Rosalie O'Connor. American Ballet Theatre’s 2019 Spring season at the Metropolitan Opera House, May 13 – July 6, will feature a World Premiere work by ABT Artist in Residence Alexei Ratmansky in programs dedicated entirely to his works in honor of the choreographer’s 10th year with the Company. The eight-week season will also include the Company Premieres of Deuce Coupe by Twyla Tharp and the full-length Jane Eyre by Cathy Marston. The Spring season was announced today by Artistic Director Kevin McKenzie. Principal Dancers for the 2019 Metropolitan Opera House season are Stella Abrera, Roberto Bolle, Isabella Boylston, Misty Copeland, Herman Cornejo, David Hallberg, Sarah Lane, Alban Lendorf, Gillian Murphy, Hee Seo, Christine Shevchenko, Daniil Simkin, Cory Stearns, Devon Teuscher and James Whiteside. American Ballet Theatre’s 2019 Spring Gala on Monday evening, May 20 will pay tribute to the 10th Anniversary year of Alexei Ratmansky as ABT Artist in Residence. Ratmansky, who was named ABT’s first Artist in Residence in 2009, has created 15 works for the Company. To celebrate his 10th year, the Gala evening will present the World Premiere of a new work by Ratmansky set to The Seasons by Alexander Glazounov, with sets and costumes designed by Robert Perdziola. For more information on ABT’s 2019 Spring Gala, please call the Special Events Office at 212-477-3030, ext. 3311. An All-Ratmansky program of repertory works is scheduled for four performances, May 21-23. In addition to the World Premiere work, the programs will include On the Dnieper (2009), Ratmansky’s first work of repertory for the Company, and Songs of Bukovina (2017), his most recent. On the Dnieper, set to a score of the same name by Sergei Prokofiev, has scenery by Simon Pastukh, costumes by Galina Solovyeva, lighting by Brad Fields and projections by Wendall K. Harrington. Ratmansky’s production of On the Dnieper received its World Premiere on June 1, 2009 at the Metropolitan Opera House, performed by Veronika Part (Natalia), Marcelo Gomes (Sergei), Paloma Herrera (Olga) and David Hallberg (Olga’s Fiancé). Prokofiev’s score for On the Dnieper was originally commissioned by the Paris Opera, and the ballet received its World Premiere in 1932 by the Paris Opera Ballet. Songs of Bukovina is set to music by Leonid Desyatnikov and features costumes by Moritz Junge and lighting by Brad Fields. The ballet was given its World Premiere on Wednesday, October 18, 2017 at the David H. Koch Theater in New York, performed by Christine Shevchenko and Calvin Royal III, as well as April Giangeruso, Lauren Post, Katherine Williams, Stephanie Williams, Marshall Whiteley, Joo Won Ahn, Duncan Lyle and Patrick Frenette. American Ballet Theatre’s recognition of Ratmansky’s work continues with performances of his full-length ballets including Harlequinade, Whipped Cream and The Sleeping Beauty. Harlequinade, staged by Ratmansky after the original by Marius Petipa, will open the Company’s Spring season on Monday evening, May 13 with Isabella Boylston, James Whiteside, Gillian Murphy and Thomas Forster in the leading roles. The production received its World Premiere by American Ballet Theatre on June 4, 2018, led by the same cast. A comic ballet in two acts, Harlequinade is set to music by Riccardo Drigo and first premiered in 1900 in St. Petersburg, Russia. 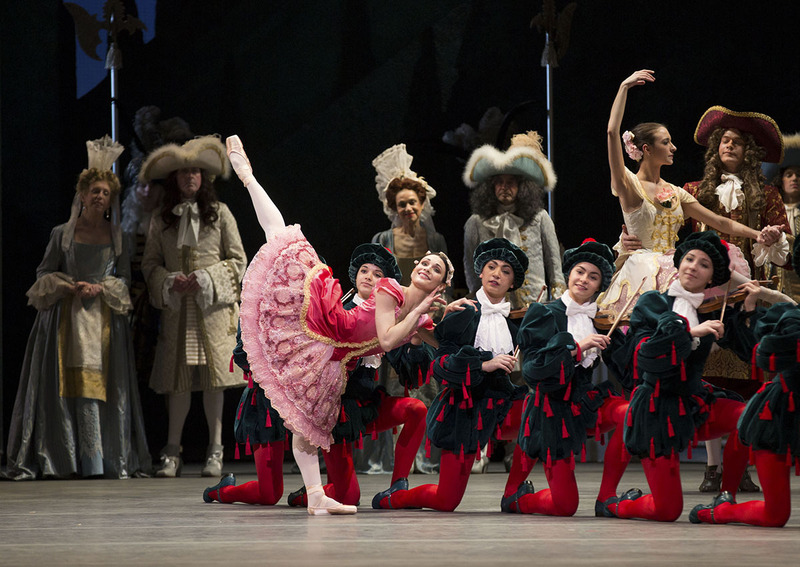 Ratmansky’s Harlequinade features sets and costumes by Robert Perdziola and lighting by Brad Fields. The ballet will be given eight performances through Saturday evening, May 18. Whipped Cream returns to the stage of the Metropolitan Opera House for seven performances beginning Friday, May 24 featuring Daniil Simkin, Hee Seo, Cory Stearns and Sarah Lane in the leading roles. Choreographed by Ratmansky, the ballet features scenery and costumes by artist Mark Ryden and lighting by Brad Fields. Whipped Cream, with a libretto and score by Richard Strauss, is based on the two-act ballet originally created as Schlagobers, which premiered at the Vienna State Opera in 1924. Ratmansky’s production received its World Premiere by ABT on March 15, 2017 at Segerstrom Center for the Arts in Costa Mesa, California danced by Daniil Simkin (The Boy), Stella Abrera (Princess Tea Flower), David Hallberg (Prince Coffee) and Sarah Lane (Princess Praline). The Sleeping Beauty returns to the Metropolitan Opera House for the first time since 2016 for eight performances beginning Monday, July 1 with Isabella Boylston and Alban Lendorf in the leading cast. Set to the classic score by Peter Ilyitch Tchaikovsky, The Sleeping Beauty has choreography by Marius Petipa and staging and additional choreography by Ratmansky, with assistance by Tatiana Ratmansky. The production features scenery and costumes by Tony Award®-winning designer Richard Hudson. Hudson’s designs are based on the historic work of Léon Bakst, who created a seminal version of The Sleeping Beauty for Serge Diaghilev’s Ballets Russes in 1921. The Sleeping Beauty received its World Premiere on March 3, 2015 at Segerstrom Center for the Arts in Costa Mesa, California, danced by Diana Vishneva (Princess Aurora) and Marcelo Gomes (Prince Désiré). The Company Premiere of the full-length Jane Eyre, choreographed by Cathy Marston, is set for Tuesday evening, June 4 with Devon Teuscher in the title role and James Whiteside as Rochester. Jane Eyre features choreography and direction by Marston, music compiled and composed by Philip Feeney, scenery and costumes by Patrick Kinmonth and lighting by Brad Fields. The production received its World Premiere by Northern Ballet on May 19, 2016 in Doncaster, England performed by Dreda Blow as Jane Eyre and Javier Torres as Rochester. Jane Eyre is a co-production with Joffrey Ballet and will be staged for ABT by Jenny Tattersall and Daniel de Andrade. Following the June 4 Company Premiere, the ballet will be given seven performances by ABT through Monday, June 10. Twyla Tharp’s 1973 hit Deuce Coupe will be given its Company Premiere on Thursday evening, May 30 as part of an All-Tharp program. Set to music by The Beach Boys, ABT’s premiere of Deuce Coupe will feature costumes by Santo Loquasto and lighting by Jennifer Tipton. Deuce Coupe was given its World Premiere in 1973 by Joffrey Ballet at the Auditorium Theater in Chicago, Illinois. The All-Tharp program will include performances of The Brahms-Haydn Variations and In the Upper Room. A ballet for thirty dancers, The Brahms-Haydn Variations, originally entitled Variations on a Theme by Haydn, is set to music by the same name by Johannes Brahms and features costumes by Santo Loquasto and lighting by Jennifer Tipton, with staging by Susan Jones. The Brahms-Haydn Variations was given its World Premiere by American Ballet Theatre at the Kennedy Center for the Performing Arts in Washington, D. C. on Tuesday, March 21, 2000, danced by Jose Manuel Carreño, Angel Corella, Marcelo Gomes, Herman Cornejo, Maxim Beloserkovsky, Sandra Brown, Julie Kent, Paloma Herrera, Ashley Tuttle and Irina Dvorovenko. In the Upper Room is set to music by Philip Glass with costumes by Norma Kamali and lighting by Jennifer Tipton. A ballet in nine parts, In the Upper Room was given its World Premiere by Twyla Tharp Dance on August 28, 1986. In the Upper Room received its ABT Company Premiere on December 10, 1988 at the Orange County Performing Arts Center in Costa Mesa, California. The ballet will be staged for ABT by Shelley Washington, with Nancy Raffa. Eight performances of Kenneth MacMillan’s Manon are scheduled to begin Monday, June 17 with Hee Seo in the title role, Roberto Bolle as Des Grieux, Stella Abrera as Lescaut’s Mistress and James Whiteside as Lescaut. Bolle will give his farewell performance with ABT in the ballet on Thursday, June 20. Staged for ABT by Julie Lincoln and Robert Tewsley, the ballet is set to music by Jules Massenet and features scenery and costumes by Nicholas Georgiadis and lighting by Thomas R. Skelton. Manon was given its World Premiere by The Royal Ballet at the Royal Opera House, Covent Garden, London on March 7, 1974, danced by Antoinette Sibley as Manon and Anthony Dowell as Des Grieux. Manon received its United States premiere by The Royal Ballet at the Metropolitan Opera House, New York on May 7, 1974, danced by the same cast. The Company Premiere of the full-length Manon was given on May 28, 1993 at the Metropolitan Opera House, New York, danced by Alessandra Ferri as Manon, Julio Bocca as Des Grieux, Gil Boggs as Lescaut, Kathleen Moore as Lescaut’s Mistress, Michael Owen as Monsieur G.M., Victor Barbee as Jailer and Georgina Parkinson as Madame. Manon was last performed by ABT in 2014. The season’s first performance of Le Corsaire on Tuesday evening, June 11 will feature Skylar Brandt, Herman Cornejo, Sarah Lane, Carlos Gonzalez and Daniil Simkin in the leading roles. Based on the Lord Byron poem “The Corsair” (1814), the ballet features choreography by Konstantin Sergeyev after Marius Petipa and staging by Anna-Marie Holmes after Petipa and Sergeyev, with music by Adolphe Adam, Cesare Pugni, Léo Delibes, Riccardo Drigo and Prince Oldenbourg. Scenery and costumes are by Irina Tibilova, with additional costume designs by Robert Perdziola and lighting by Mary Jo Dondlinger. Le Corsaire received its Company Premiere by American Ballet Theatre on June 19, 1998 with Nina Ananiashvili (Medora), Ashley Tuttle (Gulnare), Giuseppe Picone (Conrad), Angel Corella (Birbanto), Jose Manuel Carreño (Ali, the slave) and Vladimir Malakhov (Lankendem). Last presented by ABT in 2017, Le Corsaire will be given seven performances through June 15. Eight performances of Swan Lake, choreographed by Kevin McKenzie after Marius Petipa and Lev Ivanov, will be given beginning Monday, June 24 with Hee Seo and Cory Stearns leading the opening night cast. Swan Lake is set to the score by Peter Ilyitch Tchaikovsky and features scenery and costumes by Zack Brown and lighting by Duane Schuler. This production of Swan Lake premiered on March 24, 2000 at the Kennedy Center for the Performing Arts in Washington, D.C. with Julie Kent (Odette-Odile) and Angel Corella (Prince Siegfried). ABTKids, American Ballet Theatre’s annual one-hour introduction to ballet for families, is scheduled for Saturday morning, May 20 at 11:00A.M. All tickets for ABTKids are $25. Subscriptions for American Ballet Theatre’s 2019 Spring Season at the Metropolitan Opera House, on sale beginning Wednesday, October 31, are available by phone at 212-362-6000, or online at ABT’s website www.abt.org. Deuce Coupe is generously supported through an endowed gift from the Toni and Martin Sosnoff New Works Fund. Leadership support for Harlequinade, part of The Ratmansky Project, has been generously provided by the Blavatnik Family Foundation and The Marjorie S. Isaac/Irving H. Isaac Fund. Leadership support for Jane Eyre, part of the ABT Women’s Movement, has been generously provided by Denise Littlefield Sobel. Additional support has been provided by Mark Casey and Carrie Gasier Casey, Margee and John Falk, the Rockefeller Brothers Fund, Elizabeth Yntema, and through an endowed gift from the Toni and Martin Sosnoff New Works Fund. American Ballet Theatre’s performances of Le Corsaire are generously underwritten through an endowed gift from Irene and Fred Shen. American Ballet Theatre’s performances of Manon were generously supported through an endowed gift from Anka K. Palitz, in memory of Clarence Y. Palitz, Jr.
ABT gratefully acknowledges Lead Sponsor of The Sleeping Beauty, David H. Koch. Additional leadership support is generously provided by the Lloyd E. Rigler – Lawrence E. Deutsch Foundation. ABT’s production of Swan Lake has been generously underwritten by R. Chemers Neustein.